November 8, 2007, 12:20 PM · "You teach; should I? I just really enjoy working with kids and with people, but I don't know where to start..."
Whenever my performing friends say this, I can't help but try to rope them into teaching. The world needs good teachers, and if you have studied fully the instrument and have an enthusiasm for teaching others, then you have what it takes. 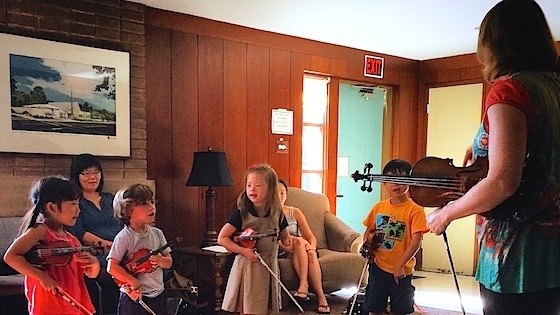 So over the years, I've encouraged a number of my performing friends to try teaching, and also to get training in violin pedagogy -- Suzuki pedagogy, if they are interested in teaching very young children. The problem is that sometimes I think people have found pedagogy training to be discouraging. For me, having taught for about five years before, pedagogy training gave me a shot in the arm. It gave me more "tricks" for my bag. It also gave me a deeper understanding of certain techniques, particularly techniques that have been easy or natural to me for a long time. I've found that the technique you struggled with most very often is the technique that you teach best. Conversely, it's harder to see what's difficult about techniques that feel "easy" to you. So why would pedagogy training be discouraging? Recently a new teacher, an excellent violinist who is clearly devoted to the idea of teaching, was comparing notes with me, asking about my approach. She'd recently taken some Suzuki pedagogy courses, and she was re-thinking various approaches to her own teaching. Before the training, she'd been letting an older beginner use the music, and afterwards she felt she needed to make her learn by rote. Before the training, she had introduced the use of lefthand fingers one way, and afterwards she felt she should try the rather complex method taught in the pedagogy training. "I don't really understand the point of what they taught me to do, actually," she said, "it's really confusing for my student, and for me. Do I have to do it that way?" We study the means and the method, but what matters is the end result. Sure, explore all the pedagogy you can, observe great teachers, read books, go see what the V.commies are saying, but in the end, it's just you and your student, learning to play. Know what you want to teach, and teach it any way that works. "Do this." I play a note, with vibrato. "Try it!" Sometimes, it's there. Usually, something is there, however elementary, and that's our starting point for deciding which of the 45 exercises will work. It's easy to be impressed with how brilliantly a pedagogy expert or experienced teacher can teach the "teaching points." Don't teach the teaching points. Teach your students. Learn all you can, and then do it YOUR way. November 9, 2007 at 02:54 AM · Laurie, I really like what you wrote. I was trained as a scientist (Ph.D., biochemistry) and just started teaching violin when I became unemployed a few years ago. I had been teaching academic subjects for years, and I loved it. My concept of teaching is that it is something like a Vulcan mind meld. You have to get inside your student's brain, find out how it works, and move with it. For teaching a given technique, there are certain words or metaphors that work well with some students but not with others. I have benefited greatly from watching my students progress through the Suzuki books and from reading everything I can by William Starr. He is a great teacher of teachers, and his writing is engaging and clear. I have learned a lot about teaching from v.com, and I have learned a lot about teaching from my students. I find it helpful to discuss goals with them periodically so I can adjust my teaching accordingly. I have spent a lot of time talking with the parents of my teachers and sometimes joining parent and child for a talk on practicing. I love working one on one with people, helping them advance, trying to give them a positive self image, and just making them smile. I enjoy being my own boss, making my own decisions, and not having to go through the layers of bureaucracy in the government, where I used to work. Teaching is by far the most rewarding, satisfying work I've ever done. My students and their parents are amazed at my patience, but it feels very natural to me. I have a specialty of teaching adult beginners, and that is another world, but one that I enjoy. My only wish is that the pay would be higher. Very, very good and so very true! November 9, 2007 at 12:45 PM · This is great! I think one reason a lot of musicians find pedagogy training discouraging is the expense. After factoring in travel costs, lost wages for missed work (most of us don't get paid when we don't work! ), and seminar fees, these expenses can spiral up quickly. What I have found to be invaluable for my own development are the private lessons I have been able to take. Working regularly with gifted communicators on a variety of material has done more for me as a teacher (and musician) than any seminar I ever attended. I have been so fortunate to have such an opportunity! November 9, 2007 at 09:11 PM · Teaching professional players or otherwise advanced violinists is vastly different from teaching the rudiments of the instrument. Each is challenging in its own way. The more advanced and serious a player is, the more they need to learn that the goal of playing well is to express the music more fully. In that respect, each technical point needs to be understood as a way for better clarity, variety or projection of an expressed idea. The implication of this is that the teacher also understand that and knows how to integrate the mechanics of playing with the expression of the intent of the music. This is not covered in the various methods of violin pedagogy, except in a very rudimentary way. I find this way of teaching to be relatively rare. November 9, 2007 at 09:41 PM · Yes!! Bravo, Ben! What you are talking about is true violinistic artistry, the use of your violinistic tools for musical expression. Ideally this happens with every note you play. This is all too rarely taught even at the conservatory level, and even more rarely taught at a less advanced level. And it is almost completely absent from the pedagogical literature. November 10, 2007 at 12:20 AM · The methods used to teach me classical violin almost destroyed my youthful desire for music. Learning a new instrument can be very difficult, especially one as unforgiving as the violin. Above all, do what U can to keep it fun for the student. If the student is struggling, unhappy, frustrated, then it is time to change your approach. November 9, 2007 at 11:07 PM · I'd love to watch you teach a lesson or two sometime, Laurie. I was over at violinmasterclass.com, laughing my head off at the "master classes" in which the student repeats as instructed and the teacher says, "Very good. Now speed it up to 120, memorize it, and play it for me next week." In general my students don't usually get what I'm trying to say the first time. After about ten different explanations and a few examples and illustrations, and maybe after about two lessons, they get it, and then it goes away, and then they get it again, and it catches on after a while for good. If only it was as simple as, "Now do it this way. Very good." November 10, 2007 at 03:43 AM · I confess curiosity about the Suzuki pedagogy for Adult Beginners. Is it as rigid (structurally) as for children? My teacher threw the books out at week 3, has given me music above my head since but the freedom for me to find other music and bring it in to work on as well. It's very disjointed but it works very well for me, I think I am making decent progress and my interest and practice schedule remains very high. Although I confess I still dodge Canon in D a lot, but the strings ensemble at work is doing it 3rd quarter so I have to buckle down on it.